Part 5 of Yuri!!! On Ice’s design series is here! Thanks to Good Haro for translating this. 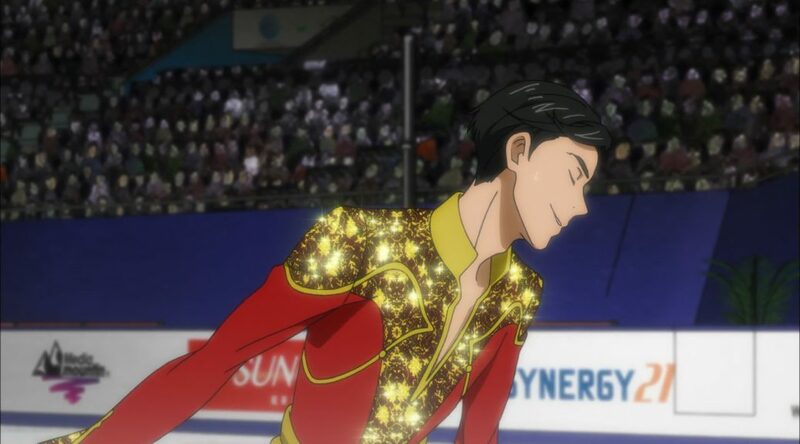 This time we’ll be talking about the short program costumes from the Cup of China in episode six. There are a lot of characters so this is one jam-packed installment! Let’s start off with Phichit Chulanont. The theme of his program was “The King and the Skater”, could you tell us a little bit about how you approached the design? As far as I understand it, Ms. Yamamoto based the concept for this look on the movie “The King and I”, so I had to think about what influences to maintain and what to change. I decided to keep the deep red color, and opted for a velour material to bring out the dignified, regal feel. 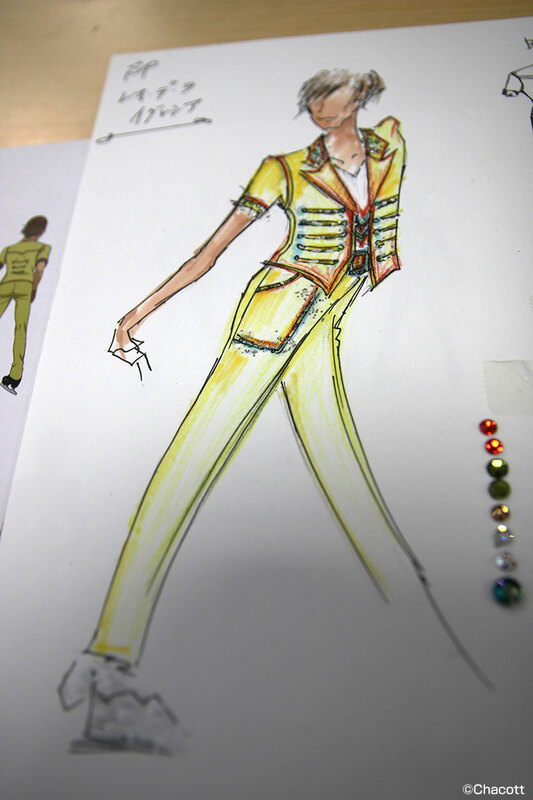 I used gold embellishments on the top and the left leg, along with a sash belt and gold chains about his hips. The design of the top changed quite a bit when it was adapted for animation, didn’t it? They also made the gold embellishments part of the boot covers. Wouldn’t adding chains weigh the costume down? When it comes to costumes, metal can be heavy and dangerous, so we don’t use it often. 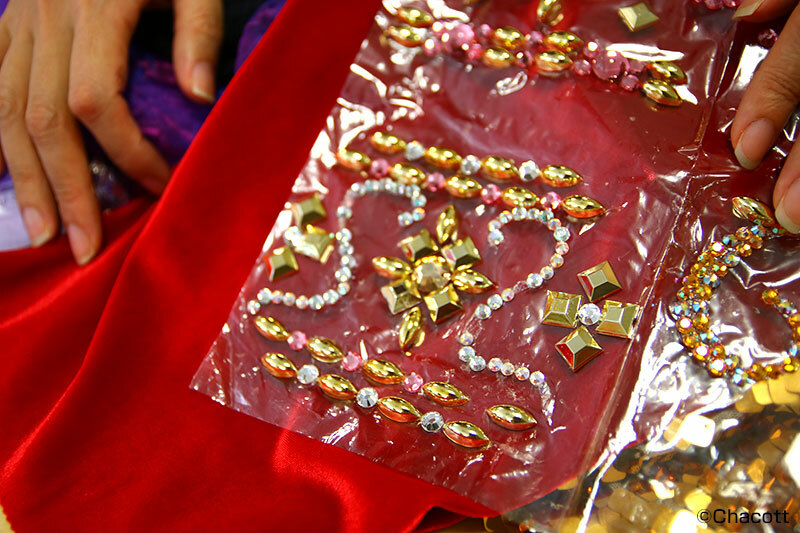 More often we use plastics or cord with some sort of appliqué to create something that looks like chain. The front of the pants is quite drapey! Yes, I was going for the harem pant look. Next, could you tell us a little about Leo De La Iglesia’s costume? Leo is Mexican-American and he would be skating to hip hop––he has a sort of Los Angeles-look––I went with a yellow color scheme and tried to bring out his youthfulness. I gave him short sleeves, a belt and even pockets to make his outfit look less like a costume and closer to normal clothes. I had the costume edged in red and lime bias tape and rhinestones, but it ended up more brown in the anime adaptation, and they added gloves. But he kept the sparkly rhinestones on his collar from the original design! Considering he choreographed the routine himself, I think Leo’s costume is very much an expression of his perspective too. Next, tell us about the very “unique” skater, Georgi Popovich’s costume. I found his costume very easy to draw because the character Carabosse from the ballet Sleeping Beauty has such a strong image. Popovich seems like someone who’s very in love with himself and strongly opinionated, so I figured he wouldn’t be one to put up with too many extra things on his costumes, so I went with a somewhat (despite how it might look) simplified design. I layered a chambray* (a fabric in which the warp and weft are different colors, giving the fabric an iridescent look) over black fabric, to give the costume a mysterious aura. I also gave him gloves to keep as much of his skin concealed as possible to enhance the impression of something inhuman and otherworldly. *- Chambray doesn’t actually sound strictly correct to me here. I might just not be familiar enough with Japan/industry-specific terminology here, but (at least commonly) chambray is a fabric easily confused for denim, which doesn’t really make sense in this context! It *is* characterized by different colored warp and weft threads though (like the sheer, iridescent, purple fabric in the photo), so perhaps she’s using it in a more generic sense. The style lines on the outfit are really interesting. Yeah, I wanted to make it really unique, so I included style lines running down the center of his pant legs, flowing along his body. I see there are feathers on the design sheet. Wouldn’t those fall off during a performance? We had feathers in one of the earlier [costumes on the show]. When we use feathers, they’re reenforced with cloth underneath, and after they’re stitched down along the shaft, they’re affixed even further with glue and rhinestones on top. 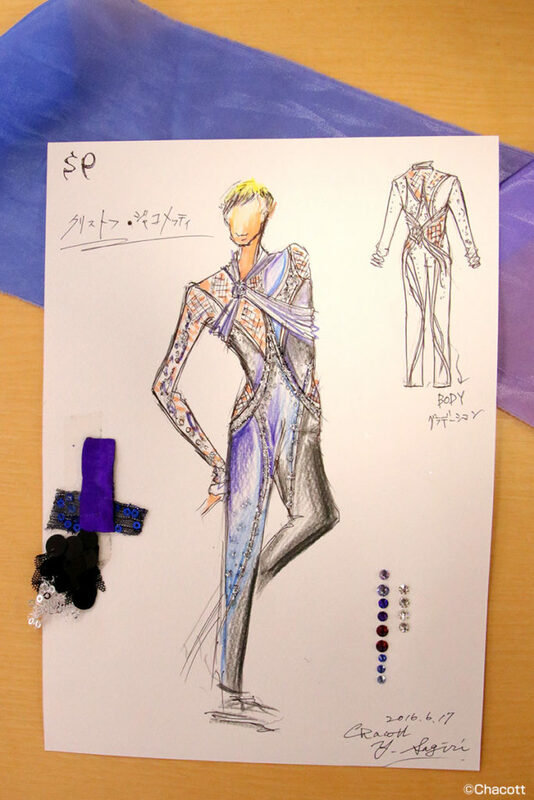 I think it’s difficult to bring the qualities of fabrics across in animation, but the overall look remained the same––that along with the hair and makeup really brought out Popovich’s “unique” character. He may take himself a little too seriously, but he seems like a really endearing character who’s sure to delight you every time. 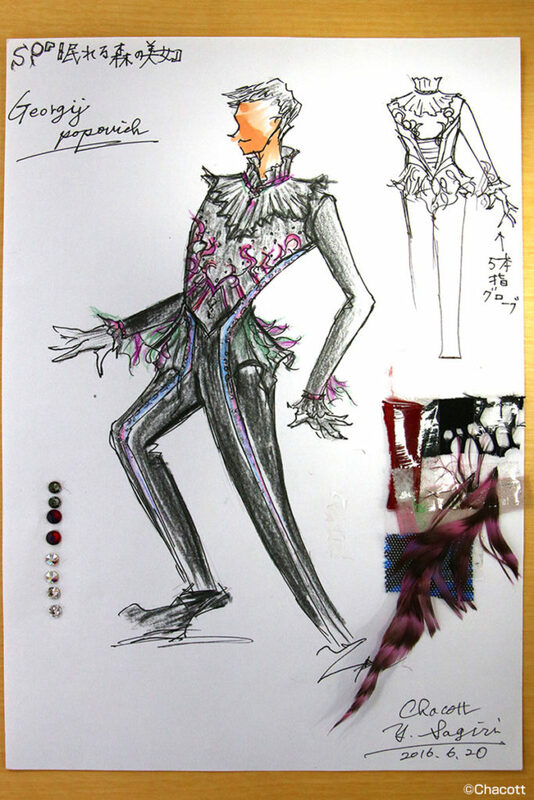 Lastly, what about Christophe Giacometti’s costume? Based on Ms. Yamamoto’s description of him, he sounded like the type to have a strong sense of aesthetics and to be really particular about his costumes, so I thought a good place to start might be with custom dyed fabric. I received the note that he should look like “he just got out of the shower”. So with that, along with the song’s lyrics, in mind I went with a blue color scheme to try to evoke the feeling of the air just before dawn breaks. I didn’t want the cut of the garment or the colors to distract from the silhouette of his body and I opted for a gradation in color to make the best of his tall stature. I wanted to make it look like the costume was flowing around him. You can see the gradient and the sparkling stones quite clearly in the anime adaptation. Though, the sections of beige netting ended up purple in the anime. And that’s it for this week. There sure were a lot of different types of costumes in the Cup of China, huh? Look forward to the free programs in the next episode! I really liked Leo’s costume! Chacott is right at saying that it looks more like normal clothes; it makes him look more modern and approachable. It’s a great glimpse of his easygoing personality. And it compared to Georgi… lol. It was pretty drastic. But it’s amazing how much the costumes speak for the characters!